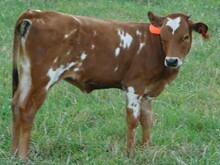 Consigned by Laid Back Ranch. OCV'd. Proof in the pedigree. 80" sire and grandsires, She is going to have the size, body, and color to fit any program.